I'm still in (sort of) sunny Devon, so after a hella long cliff walk yesterday I really needed something deliciously carb-filled, yet still nutritious for dinner. This recipe was the end result. This is a great meal for using up leftovers, as nearly any vegetables can be thrown in to add flavour or alter the nutritional benefits of the dish. 1.) Peel and chop the onion, spring onion and garlic. 2.) Slice the cucumber, quarter it, and chop the pepper and tomatoes. Make sure any pepper seeds are removed unless you want the added heat from these in the dish. 3.) Heat some oil in a frying pan or wok. 4.) Add all of the chopped ingredients to the pan. 6.) Toss for four or five minutes until the vegetables have gone soft. 8.) Toss for another two minutes or so. It is now ready to serve. Enjoy! 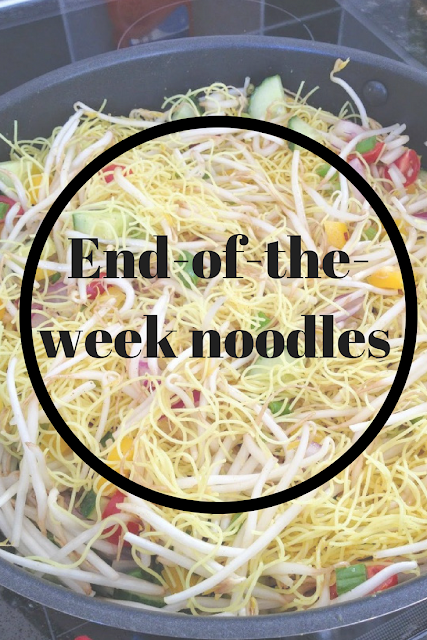 What's your favourite go-to recipe with noodles? I also just followed you on Bloglovin, if you could do the same! I tried this out. It was DELICIOUS! I just started blogging as well. In order for your audience to know you better as well as myself, I nominated you to complete the Liebster Award. Do participate, it is really fun! Ah good, I loved it too!